As we mentioned in the Bus Pirate case video, we are trying to get fcobcn’s milled Bus Pirate case turned into a molded product. Molded cases are pretty cheap, unfortunately the molds are thousands of dollars. Proto Labs offers free quick-turnaround molds to deserving projects. We believe fcobcn’s case is such a project, so we’re applying for a Cool Idea Award. If the project wins, they’ll donate the molds to us and we’ll but a few thousand cases. Follow below for our ‘beta’ application form responses. Comments and literary advice welcome. The Bus Pirate is a tool for working with new or unknown electronic chips. Over the last 5 years it’s been developed by a community of engineers, and sold world wide as a circuit board without a case. It’s open source hardware, which means anyone can reuse the design in their own project. Our Cool Idea is to produce a molded case for the Bus Pirate, specifically an open source case prototyped by a community member. Your investment in a mold for a Bus Pirate case will net you an ongoing customer. We’ll need cases to sell with new Bus Pirates from our website and distributors, and but there’s also tens of thousands of existing Bus Pirate owners who might want one too. The Bus Pirate talks to lots of different electronic chips using different protocols. It translates simple commands typed on a computer into signals that microchips understand, any reply is returned to the user. 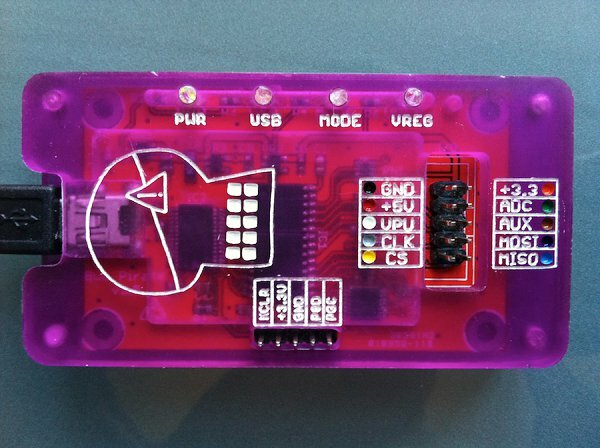 A community member designed a simple two-part milled case to surround the Bus Pirate circuit board. The two halves are held together by small magnets. There’s also space for light pipes that carry the indicator lights to the top of the case. Describe the application of your product and why your product benefits the end user. The Bus Pirate is a open source multitool that helps engineers quickly build and test their new designs. A simple interface to many standard electronic parts helps users quickly learn how to work with them, without actually building a complete project. It also programs a range of chip, test servo motors, and does some electronic measurement. Since it is open source, parts of the design have landed in projects totally independent of the Bus Pirate. A Bus Pirate case protects the bare circuit board, and makes the overall device more attractive. Describe why your product is cool. Everything in the project is completely open source. Anyone is free to rework the case and mill it themselves, use it as a basis for their next new product, or try our files to get an example quote from Proto Labs. We’ll also document our experience, to help other designers see how we went from milled prototype to a molded product. Where are you in the development process? Have you made a prototype? If so, what process was used to create your prototype (CNC machining, SLA, SLS, etc.)? Prototypes have been made by CNC milling. Pictures are available here. Should you be named a recipient of the award, what length of time would be required before Proto Labs could promote your product (immediately after Proto Labs has produced the parts, 6 months, 1 year, etc.)? Before, during, and after producing the parts. We’re well known for our how-tos and tutorials. We’d like to document the process of working with you, it could help other prospective designers choose Proto Labs/protomold. What is the suggested retail price of your product (U.S.D.)? The Bus Pirate case will retail for $5-$10USD individually. The Bus Pirate v3 currently sells for $30USD, and we’re targeting $35-$40USD including the case. If we receive the cool idea award, we’d like to add ‘Molded by Proto Labs’ to the production case as a thank you. This entry was posted on Wednesday, December 14th, 2011 at 5:30 pm	and is filed under cases, Editorial. You can follow any responses to this entry through the RSS 2.0 feed. You can skip to the end and leave a response. Pinging is currently not allowed. let’s hope to have good luck. If you consider the possibility of having some holes in the bottom, the housing could be designed with two equals parts assembled together; this saves one mould.